David Robertson is headed to the injured list. 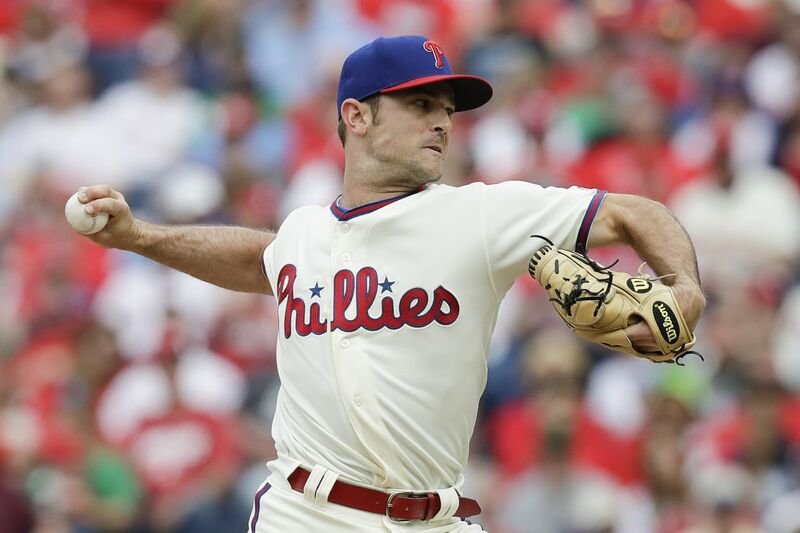 The Phillies placed reliever David Robertson on the injured list on Monday afternoon after the elbow soreness he managed through spring training became too much for him to pitch with. Robertson and manager Gabe Kapler said that they were not concerned about the pitcher’s long-term availability, but an MRI on Tuesday will provide a clearer picture of how long the Phillies will be without the reliever they signed this winter to a two-year, $23 million contract. The injury comes just as Robertson was beginning to right his season following three rough outings to start his career with the Phillies. He pitched two scoreless innings on Sunday in Miami and had not allowed a run in four appearances since walking three-straight batters -- including the losing run -- earlier this month in Washington. Robertson was replaced on the 25-man roster by righthander Drew Anderson, who was starting at triple A but will be used as a long reliever by the Phillies. The Phillies were attracted to Robertson this winter because of his willingness to be used in various roles. He was the prototypical reliever for Kapler’s bullpen style and the manager was quick to thrust Robertson into higher-leverage situations. Kapler will now need to navigate the late innings without Robertson and Tommy Hunter, two relievers who began spring training as key pieces of the bullpen. Hunter, who is in Clearwater, Fla., with an arm injury, is at least a month away from debuting this season. Kapler will rely heavily on Pat Neshek, Hector Neris, Seranthony Dominguez, and Hector Neris. Kapler, glancing at Monday night’s lineup sheet, observed how the Mets’ lefthanded-heavy lineup would be a good chance for the Phillies to utilize Robertson’s cutter and curveball. But a few hours earlier, the reliever told Kapler he was sore. And the manager could not ignore it. He would have to find another way to attack the Mets. “We just kind of felt like this was the right time to get him some rest,” Kapler said. The Phillies and Major League Baseball will announce Tuesday afternoon at Independence Hall that the 2026 All-Star Game will be held at Citizens Bank Park in conjunction with America’s 250th birthday. The event will begin at 2 p.m. and is open to the public. Bryce Harper, Rhys Hoskins, Jake Arrieta, Odubel Herrera, Rhys Hoskins, Andrew McCutchen, Aaron Nola, and Jean Segura are scheduled to appear, along with former Phillies All-Stars Mike Schmidt, Jimmy Rollins, Larry Bowa, Dave Cash, Bob Boone, Ricky Bottalico, and Greg Luzinski. Scott Kingery was out of Monday’s lineup after having five hits over the weekend in Miami. Kapler said it was a tough choice to keep him on the bench and “my expectation is that we’re going to look for ways to get him into the lineup in the next couple of days.”... Nick Pivetta will start Tuesday night against lefthander Steven Matz.